For Roebeast's Trash Bash 2011 one of the pictures of the finished entry needed an "in game" background shot. Since no one (not even ME) actually plays StarGods (YET!) I had to get some minis together that have been converted, for the mostly non-existent ruleset, and some others that would fit the setting. These are a handful from the first "game" I set up. 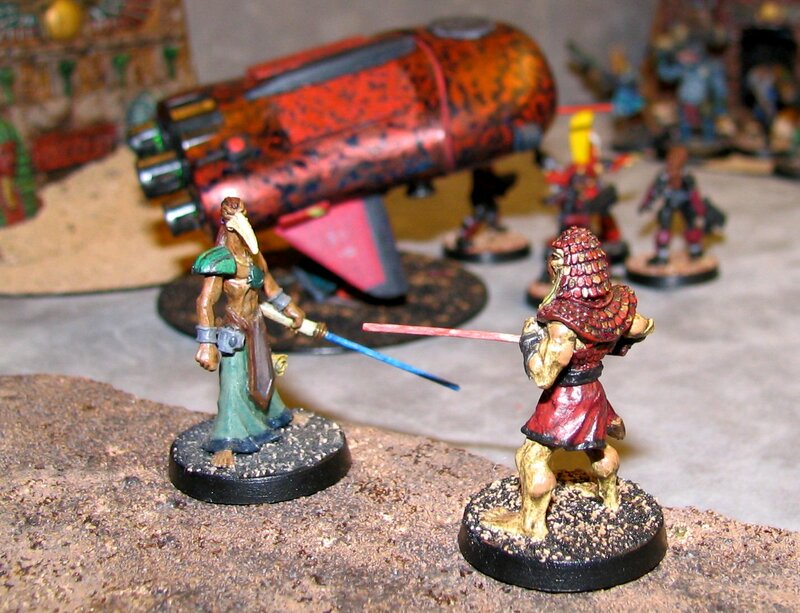 The situation is a raid by the Yiksossi/Pharaonic Loyalists Patrol under the leadership of Loyalist Assessor (not-Jedi Knight) Harakthe (the Heru one in red) and Rogue Assessor Scarmoth's band of scrappy rebels. The Reiver takes center stage here. It has disgorged a 4-man Raider Team (some Void minis that were surprisingly already painted to match the Reiver) led by a Yiksossi Noble (the fancy Eldar guy). At the entrance to the rebel Base is a motley defense line ready to meet the foreign invaders (L-R: Khanumite, conversion of a Khemru Slinger; Sobekite, conversion of a Sebeki; Sirian Horus Regiment Defetor, an olde Star Trek Security Officer from RAFM[? 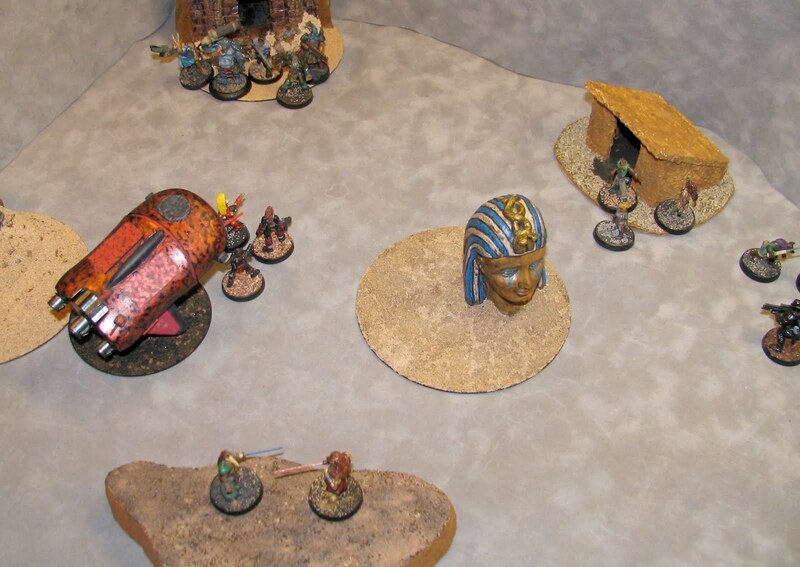 ]; Rogue Ptah [Droid/Robot], conversion of a Void Syntha guy; and a Cthood Mercenary, Wargames Factory Shock Trooper with the squid-head). 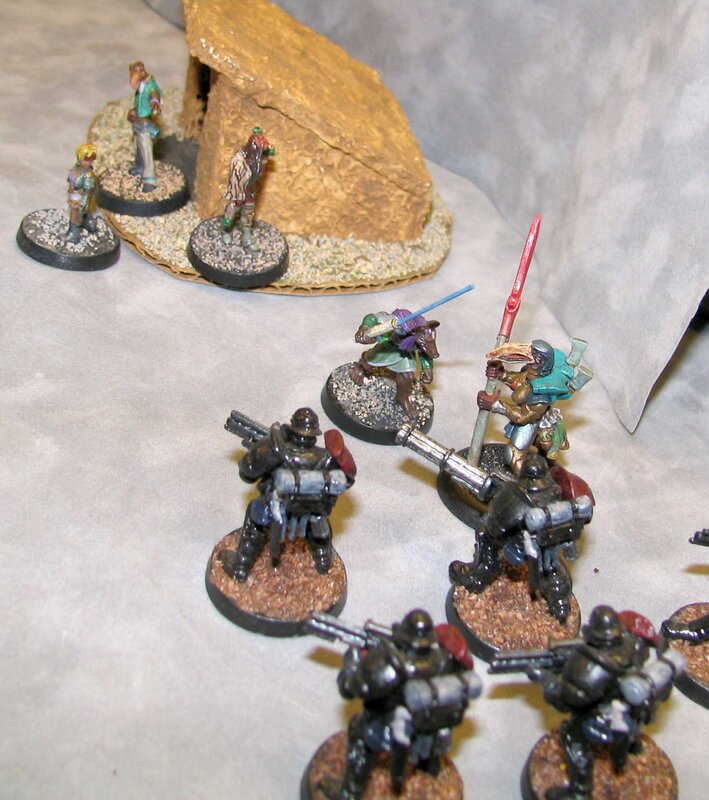 On another part of the battlefield, Apprentice Nebseni charges into a Loyalist Army unit led by a Tothian Female Noble. 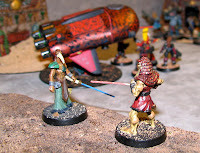 Nebseni is supported by some other Rebels including the Philosopher Rabhicca (the Nekharu conversion guy who is meant to be a non-Jedi wizard or something).